This page shows an overview of some of the work that I did during my Master in Media Innovation and MSc in Interaction Design as well as independent projects that I would like to share. project includes a prototype dog toy that could emit both sounds and smells, which are usually regarded as a dog’s most receptive and well-developed senses. The aim of this project was to initiate a participatory design experiment in which the designer would develop a dependency on the dogs in terms of sensory and playful preferences. I developed a lo-fi prototype that includes a soft toy inside of which a phone could be hidden that can play pre-recorded sound files of 20/30 seconds that could be recognizable for the dogs (such as a talking family member, soundscapes from a local forest, and a familiar barking dog). Another compartment of the toy contained objects that had specific smells that the dogs could be familiar with (such as a branch from the forest that they played with, a t-shirt of a family member and a blanket of a familiar dog, who both live in other countries). I wanted to create an open-ended toy and leave further ideas about its development up to the way in which the interaction would be played out during the testing sessions. By testing the toy-prototype with my dogs I wanted to explore their responses and their general interest in this type of interface. In order to explore a dog’s reactions to an interactive robotic object, I experimented with a device called Sphero, a ball that is connected with a smartphone through Bluetooth and can be moved around by a human through an interface on a smartphone. Over a period of five weeks, I tested the device in different prototype iterations such as with the use of different covers, food incentives, LEGO, and eventually I built a hi-fi prototype with with the laser cutter including four different types of dog puzzles made from MDF that can be mounted on the Sphero. Together with Alex Camilleri we are putting a lot of our free time into the development of a tablet game for cats and humans. 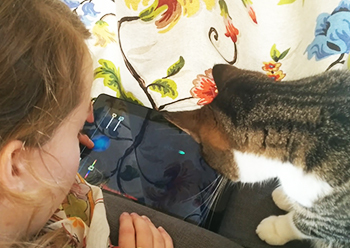 We started to develop this game because we are convinced that we, as humans, can develop better tablet entertainment for cats than the applications that currently exist. Felino is a digital toy that allows humans and cats to play together. The main objective of Felino is really simple: enjoy and share playful moments with your feline companion. No highscores, no time pressure, no game-over – rather an experience that is more understandable for a cat: time spent playing together. For the Global Game Jam 2014 me and Alex Camilleri made a digitally augmented variant of hopscotch, called Dogscotch, that can be played together with a dog. In the activity of play, humans can form complex abstractions and embrace structured rules to experience games. We often use our imagination while playing games; dogs just perceive the environment the way it is. These two opposing perceptions come together in this game, created in 48 hours. We interpreted the global theme of this gamejam from the perspective of a dog: “We don’t see things as they are, we see them as we are” (Dog, 2014). More information can be found here, and the game itself can be downloaded here. 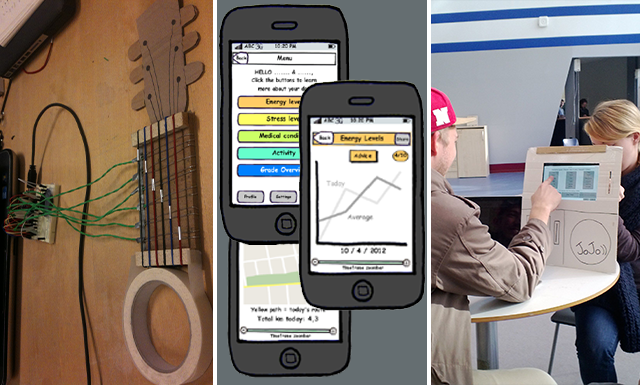 At Malmö University I followed a course called ‘Embodied Interaction’. In this course we learned about physical computing and interaction using the presence of a body in time and space. One of the weekend assignments after a couple of classes in Arduino and Processing was to make a simple game using physical buttons. I got the idea to make a videogame that could be controlled by my dog. To do this, I made the buttons with wood, aluminium foil, and sponge, and I used the Arduino Uno (+ the IDE), a breadboard with some wires, and I coded in Processing. This video shows the result. More information on this project can be found here. How About some Coffee Tobii? Finalist during the Nordic Gamejam 2015 and made together with Ciro Continisio and Alex Camilleri. 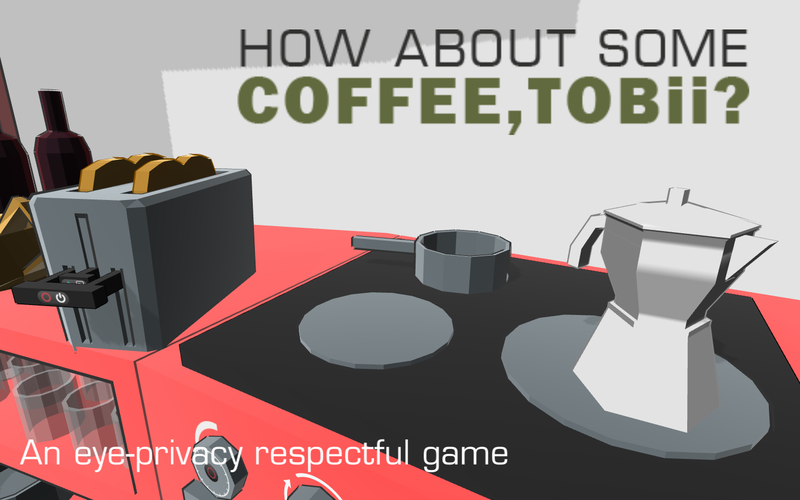 This is a game about having breakfast. Also about Mars. The game can be downloaded here. SPACEd out (left image below) was made for the Ludum Dare 27 gamejam in 2013 together with Alex Camilleri. The game can be downloaded here. 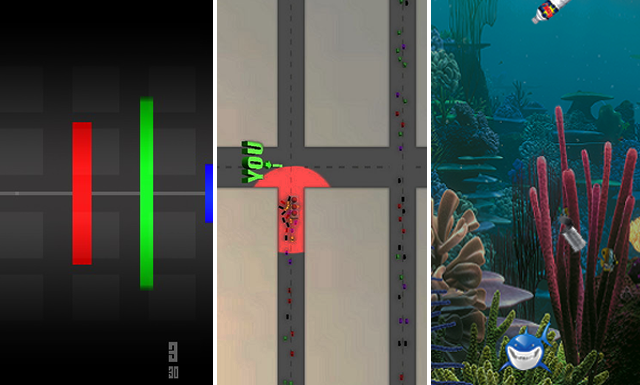 This game (middle image below) won the first prize at the No More Sweden gamejam in 2013 and was developed together with Alex Camilleri, David Oppenberg, and Mattia Traverso. This game can be downloaded here. Ocean Trash (right image below) was developed during a course in Processing in 2013, together with Laura Schipien. For this game I mainly learned about game programming in Java using Processing. During my studies I gained some experience in both digital and physical prototyping. I would like to share three very different projects in this field. In the first project we created a music instrument using an Arduino, a Piezo speaker that can play small melodies, hair bands, wood, and some wires. This project was carried out in collaboration with Inge van Hoppe and the prototype is pictured on the left in the image below. The second project includes a prototype for a mobile application that connects through Wifi with a dog-collar. This collar features GPS, hearth rate and body temperature measurements to monitor a dog’s physical well-being. This prototype was then used for heuristic evaluations and user testing. A couple of prototype screenshots are shown in the middle of the image below. A third project consisted of a redesign of a ticket-payment machine on the train station in Malmö, Sweden. We redesigned the interface and developed a physical prototype, including the machine’s exterior and screen, using a tablet and carton assets. During this project we carried out several user tests and iterations on the design. This assignment was done in a team with Luisa Fabrizi, Stephan Fortelny, and Tim von Oldenburg. An example of the prototype and user testing is shown on the right in the image below. Another physical prototyping project I want to share is a project that was carried out for Malmö Symphony Orchestra. The orchestra organizes classical music concerts for young children and their own stuffed animals. The concert is narrated by Nalle, a teddy bear that has many adventures. This project aims to bring the Nalle experience outside the theater in the foyer before and after the concert takes place. Together with Inge van Hoppe and Dariela Escobar, we designed and developed seven rings that each represent one instrument group from the orchestra (such as violins, percussion, woodwinds, etc.). When the LED lights are blinking, the children can throw their stuffed animal through the rings and if they are successful the LEDs light up and the instruments start playing. This project consist out of seven wooden rings containing LED strips and ultrasound sensors to detect the stuffed animals going through. The cables are hidden in PVC tubes and connected with an Arduino. In order to start the correct music loop we used Max/MSP software.